Text: Psalms 115:4-117:2 (recto). A scan of the verso is not currently available, but it likely contained Psalms 117:3-11. Reconstruction Note! 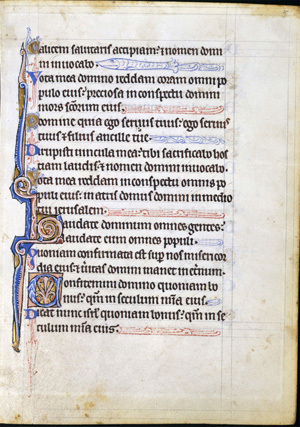 In Ege's original psalter, this leaf was followed by what is now Leaf 10 in the Ohio State University portfolio. The latter was, in turn, followed by what is now Leaf 10 in the Rochester Institute of Technology portfolio. Placed back in sequence, the three leaves contain the text of Psalms 115:4 to 118:22. Cálicem salutáris accípiam, et nomen Dómini invocábo. Vota mea Dómino reddam coram omni pópulo ejus. Pretiósa in conspéctu Dómini mors sanctórum ejus. O Dómine, quia ego servus tuus; ego servus tuus, et fílius ancíllæ tuæ. Dirupísti víncula mea: tibi sacrificábo hóstiam laudis, et nomen Dómini invocábo. Vota mea Dómino reddam in conspéctu omnis pópuli ejus; in átriis domus Dómini, in médio tui, Jerúsalem. Laudáte Dóminum, omnes gentes; laudáte eum, omnes pópuli. Quóniam confirmáta est super nos misericórdia ejus, et véritas Dómini manet in ætérnum. Confitémini Dómino, quóniam bonus, quóniam in saeculum misericórdia ejus. Dicat nunc Israël: Quóniam bonus, quóniam in saeculum misericórdia ejus. 4 I will take the chalice of salvation; and I will call upon the name of the Lord. 5 I will pay my vows to the Lord before all his people: 6 precious in the sight of the Lord is the death of his saints. 7 O Lord, for I am thy servant: I am thy servant, and the son of thy handmaid. Thou hast broken my bonds: 8 I will sacrifice to thee the sacrifice of praise, and I will call upon the name of the Lord. 9 I will pay my vows to the Lord in the sight of all his people: 10 in the courts of the house of the Lord, in the midst of thee, O Jerusalem. O Praise the Lord, all ye nations: praise him, all ye people. 2 For his mercy is confirmed upon us: and the truth of the Lord remaineth for ever. Give praise to the Lord, for he is good: for his mercy endureth for ever. 2 Let Israel now say, that he is good: that his mercy endureth for ever.